While we don’t normally think of ISO as a virtual machine image format, since ISOs contain bootable filesystems with an installed operating system, you can treat them the same as you treat other virtual machine image files. Image conversion - Convert images by calling the task API while importing an image (only qcow/raw format conversion is available for the Kilo release). Internally, Image service receives the bits of the image in a particular format. These bits are stored in a temporary location. The plugin is then triggered to convert the image to the target format, and moved to a final destination. When the task is finished, the temporary location is deleted. As a result, the format uploaded initially is not retained by the Image service. Image Introspection - Every image format comes with a set of metadata embedded inside the image itself. By introspecting this vmdk, you can easily know that the disk_type is streamOptimized, and the adapter_type is buslogic. By doing this metadata extraction in the Image service, the administrator does not have to care about all of these metadata unless they want to override some of them. These metadata parameters are useful for the consumer of the image. In Compute, the workflow to instantiate a streamOptimized disk is totally different than the one to instantiate a flat disk. This new feature allows metadata extraction. You can achieve image introspection by calling the task API while importing the image. For the Kilo release, you can only introspect the virtual_size metadata parameter. The OpenStack Image service (glance) provides discovery, registration, and delivery services for disk and server images. It provides the ability to copy or snapshot a server image, and immediately store it away. Stored images can be used as a template to get new servers up and running quickly and more consistently, than installing a server operating system and individually configuring additional services. The copy_from feature in the Image Service API v1 allows an attacker to perform masked network port scans. It is possible to create images with a URL such as http://localhost:22. This could allow an attacker to enumerate internal network details, because the scan appears to originate from the Image Service. This is classified as a Server-Side Request Forgery (SSRF). All copy_from calls are logged by the Image Service. This makes it possible to link the abuser of this vulnerability to the cloud user exploiting it. For this flaw to be exploited, image creation must be enabled and non-admin users must be able to use the copy_from function. To prevent attackers from exploiting this flaw, restrict the policy for the copy_from function to the admin role. Limiting the copy_from function to admin users impacts Orchestration and dashboard usage. For example: Any Orchestration stacks for non-admin users that create images will break. Non-admin users will not be able to create images in the dashboard by providing an image-data URI. Rate-limiting calls to the Image Service, which makes network probing extremely slow and may deter attacks. Limiting connections from the control-plane node that runs the glance-api server to the ports required for the services and ports 80 and 443 towards the external network. This action would significantly limit the scope of an attack without affecting the majority of users. This section provides you with the steps to manually create OpenStack-compatible images in .qcow2 format using Red Hat Enterprise Linux 6 and Red Hat Enterprise Linux 7 ISO files. 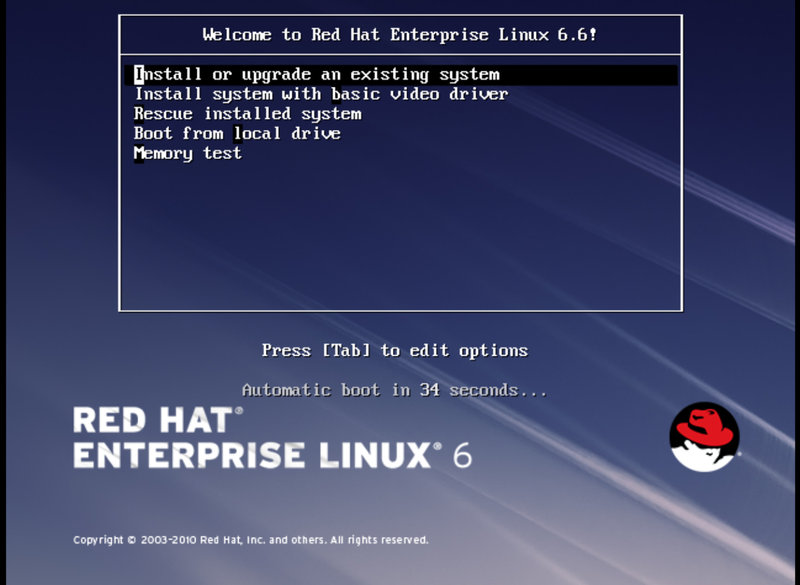 If you want to create custom Red Hat Enterprise Linux images, see Create a Red Hat Enterprise Linux 7 Image or Create a Red Hat Enterprise Linux 6 Image. 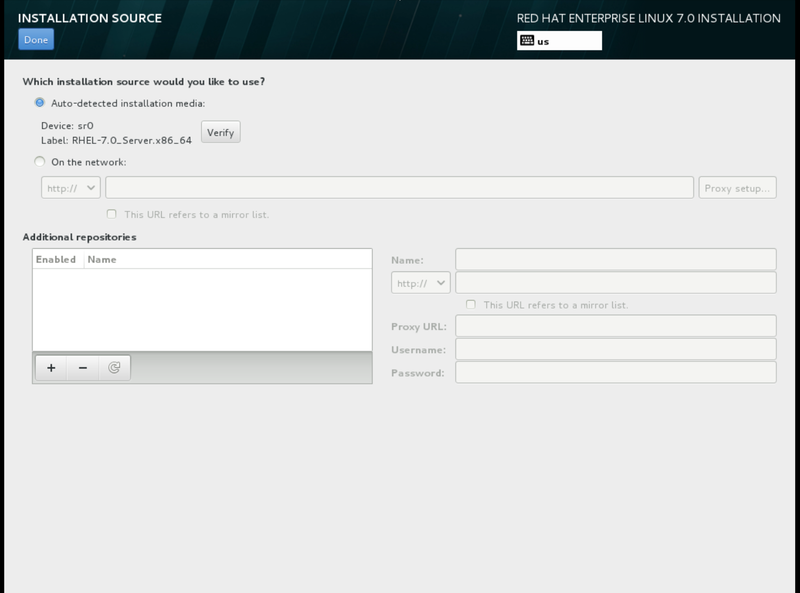 A Red Hat Enterprise Linux 7 ISO file (see RHEL 7.0 Binary DVD or RHEL 6.6 Binary DVD). Text editor, if you want to change the kickstart files. In the following procedures, all commands with the [user@host]# prompt should be run on your host machine. This section provides you with the steps to manually create an OpenStack-compatible image in .qcow2 format using a Red Hat Enterprise Linux 7 ISO file. 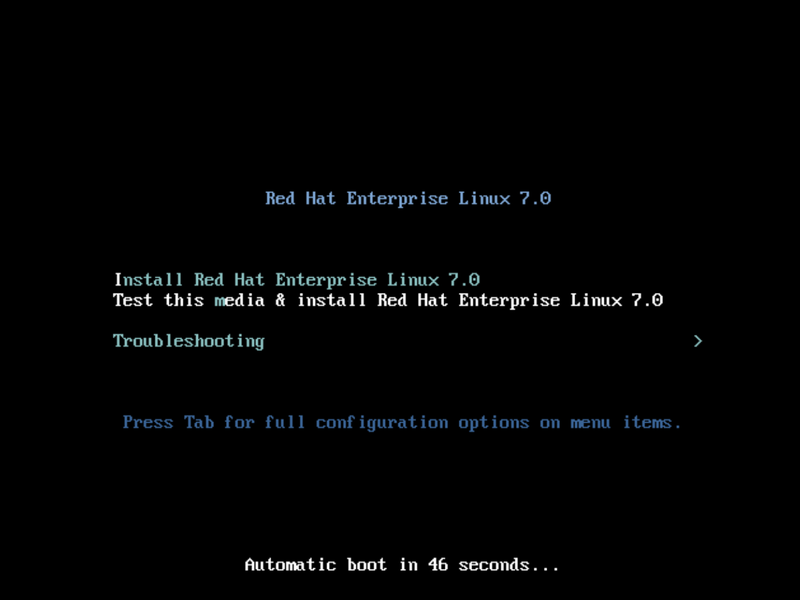 At the initial Installer boot menu, choose the Install Red Hat Enterprise Linux 7.0 option. For network and hostname, choose eth0 for network and choose a hostname for your device. The default hostname is localhost.localdomain. For Red Hat OpenStack Platform 8, the required channels are rhel-7-server-openstack-8-rpms and rhel-7-server-rh-common-rpms. For more information, see "Subscribe to the Required Channels" in the Installation Reference. Add the following line to /etc/sysconfig/network to avoid problems accessing the EC2 metadata service. Un-register the virtual machine so that the resulting image does not contain the same subscription details for every instance cloned based on it. This section provides you with the steps to manually create an OpenStack-compatible image in .qcow2 format using a Red Hat Enterprise Linux 6 ISO file. The installation checks for disc and performs a Media Check. When the check is a Success, it ejects the disc. Choose a hostname for your device. The default hostname is localhost.localdomain. For Red Hat OpenStack Platform 8, the required channels are rhel-7-server-openstack-8-rpms and rhel-6-server-rh-common-rpms. To prevent network issues, create /etc/udev/rules.d/75-persistent-net-generator.rules file. You can also use the glance image-create command with the property option to create an image. More values are available on the command line. For a complete listing, see Image Configuration Parameters. 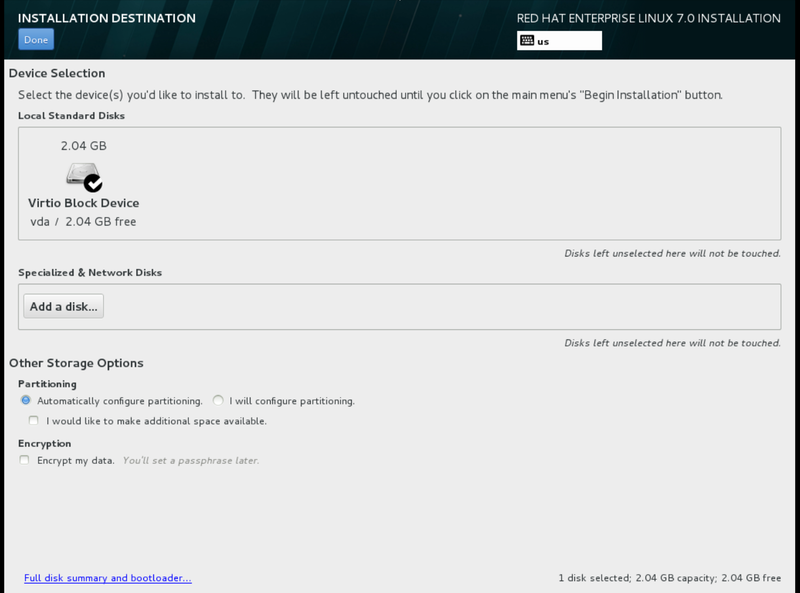 Select Network > Networks, and ensure there is a private network to which you can attach the new instance (to create a network, see Add a Network section in the Networking Guide available at Red Hat OpenStack Platform). Select Compute > Access & Security > Key Pairs, and ensure there is a key pair (to create a key pair, see Section 2.2.1.1, “Create a Key Pair”). To view boot-source images, select the Images tab (to create an image, see Section 1.2.2, “Create an Image”). To view boot-source volumes, select the Volumes tab (to create a volume, see Create a Volume in the Managing Storage Guide available at Red Hat OpenStack Platform). Select Compute > Access & Security > Security Groups, and ensure you have created a security group rule (to create a security group, see Project Security Management in the Users and Identity Management Guide available at Red Hat OpenStack Platform). Fill out instance fields (those marked with '* ' are required), and click Launch when finished. Zones are logical groupings of cloud resources in which your instance can be placed. If you are unsure, use the default zone (for more information, see Section 2.4, “Manage Host Aggregates”). The flavor determines what resources the instance is given (for example, memory). For default flavor allocations and information on creating new flavors, see Section 2.3, “Manage Flavors”. If a volume or volume source is selected, the source must be formatted using an image (see Basic Volume Usage and Configuration in the Managing Storage Guide available at Red Hat OpenStack Platform). Security groups contain firewall rules which filter the type and direction of the instance’s network traffic (for more information on configuring groups, see Project Security Management in the Users and Identity Management Guide available at Red Hat OpenStack Platform). You can provide either a set of commands or a script file, which will run after the instance is booted (for example, to set the instance hostname or a user password). If 'Direct Input' is selected, write your commands in the Script Data field; otherwise, specify your script file. Add and remove security groups to or from this instance using the list of available security groups (for more information on configuring groups, see Project Security Management in the Users and Identity Management Guide available at Red Hat OpenStack Platform). Bring up the Resize Instance window (see Section 2.1.4, “Resize an Instance”). For more information about setting up SSH key authentication, see Configure SSH Tunneling Between Nodes in the Migrating Instances Guide available at Red Hat OpenStack Platform. Deleting an instance does not delete its attached volumes; you must do this separately (see Delete a Volume in the Managing Storage Guide available at Red Hat OpenStack Platform)). For information on managing security groups, see Project Security Management in the Users and Identity Management Guide available at Red Hat OpenStack Platform. For more information on managing project security, see Project Security Management in the Users and Identity Management Guide available at Red Hat OpenStack Platform. Projects have a limited range of floating IP address that can be used (by default, the limit is 50), so you should release these addresses for reuse when they are no longer needed. Floating IP addresses can only be allocated from an existing floating IP pool, see Create Floating IP Pools in the Networking Guide available at Red Hat OpenStack Platform. On the Floating IPs tab, click the address' menu arrow (next to the Associate/Disassociate button. Ensure that the instance’s security group has an SSH rule (see Project Security Management in the Users and Identity Management Guide available at Red Hat OpenStack Platform). Ensure the instance has a floating IP address (external address) assigned to it (see Create, Assign, and Release Floating IP Addresses). Obtain the instance’s key-pair certificate. The certificate is downloaded when the key pair is created; if you did not create the key pair yourself, ask your administrator (see Section 2.2.1, “Manage Key Pairs”). Behavior set using image properties overrides behavior set using flavors (for more information, see Section 1.2, “Manage Images”. Pre-defined keys determine hardware support or quotas. Pre-defined keys are limited by the hypervisor you are using (for libvirt, see Table 2.5, “Libvirt Metadata”). Both pre-defined and user-defined keys can determine instance scheduling. For example, you might specify SpecialComp=True; any instance with this flavor can then only run in a host aggregate with the same key-value combination in its metadata (see Section 2.4, “Manage Host Aggregates”). Under Available Metadata, click on the Other field, and specify the key you want to add (see Table 2.5, “Libvirt Metadata”). numa_mem.0 - Mapping N GB of RAM to NUMA node 0.
numa_mem.1 - Mapping N GB of RAM to NUMA node 1. The scheduler looks for a host with 2 NUMA nodes with the ability to run 6 CPUs + 3 GB of RAM on one node, and 2 CPUS + 1 GB of RAM on another node. 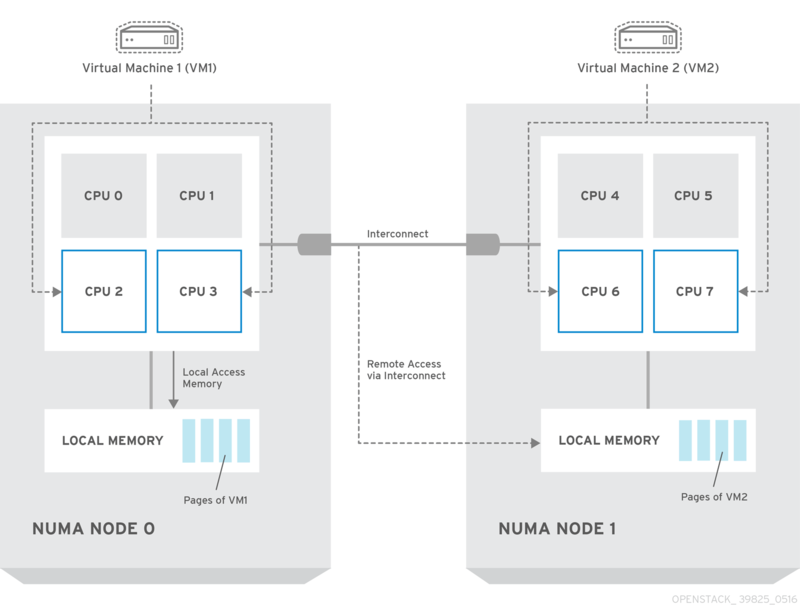 If a host has a single NUMA node with capability to run 8 CPUs and 4 GB of RAM, it will not be considered a valid match. The same logic is applied in the scheduler regardless of the numa_mempolicy setting. cpu_quota - Maximum allowed bandwidth (in microseconds) for the vCPU in each cpu_period. The value must be in range [1000, 18446744073709551]. '0' means 'no value'; a negative value means that the vCPU is not controlled. cpu_quota and cpu_period can be used to ensure that all vCPUs run at the same speed. Under Available Metadata, click on the Other field, and specify the key you want to add. Use predefined keys (see Table 2.6, “Host Aggregate Metadata”) or add your own (which will only be valid if exactly the same key is set in an instance’s flavor). The Compute scheduling service determines on which cell or host (or host aggregate), an instance will be placed. As an administrator, you can influence where the scheduler will place an instance. For example, you might want to limit scheduling to hosts in a certain group or with the right RAM. Filters - Determine the initial set of hosts on which an instance might be placed (see Section 2.5.1, “Configure Scheduling Filters”). 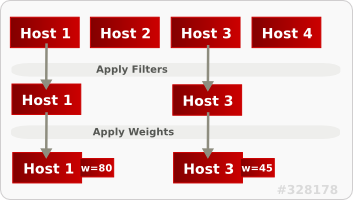 Weights - When filtering is complete, the resulting set of hosts are prioritized using the weighting system. The highest weight has the highest priority (see Section 2.5.2, “Configure Scheduling Weights”). Scheduler service - There are a number of configuration options in the /etc/nova/nova.conf file (on the scheduler host), which determine how the scheduler executes its tasks, and handles weights and filters. There is both a host and a cell scheduler. 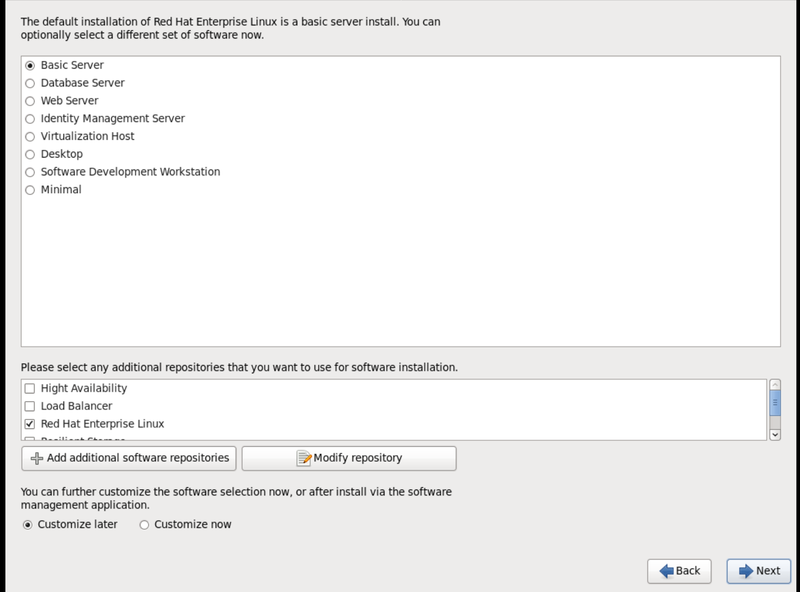 For a list of these options, refer to the "Configuration Reference" (RHEL OpenStack Platform Documentation). The nova boot command, see the "Command-Line Interface Reference" in RHEL OpenStack Platform Documentation. Only passes hosts in host aggregates whose metadata matches the instance’s image metadata; only valid if a host aggregate is specified for the instance. For more information, see Section 1.2.2, “Create an Image”. Metadata in the host aggregate must match the host’s flavor metadata. For more information, see Section 2.3.4, “Update Flavor Metadata”. Uses the cpu_allocation_ratio in the /etc/nova/nova.conf file to filter out hosts exceeding the over commit ratio(virtual CPU to physical CPU allocation ratio). The default value is 16.0 (16 virtual CPU can be allocated per physical CPU). Uses disk_allocation_ratio in the /etc/nova/nova.conf file to filter out hosts exceeding the over commit ratio(virtual disk to physical disk allocation ratio). The default value is 1.0 (one virtual disk can be allocated for each physical disk). Only passes hosts that match the instance’s image properties. For more information, see Section 1.2.2, “Create an Image”. You define which cell weighers you would like the scheduler to use in the [cells] scheduler_weight_classes option (/etc/nova/nova.conf file; you must have either root or nova user permissions). 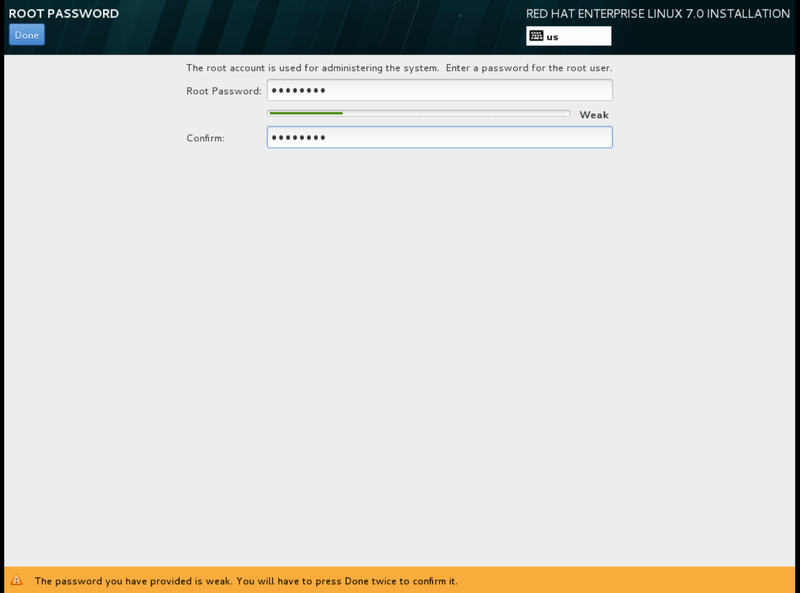 The use of cells is available in this release as a Technology Preview, and therefore is not fully supported by Red Hat. It should only be used for testing, and should not be deployed in a production environment. For more information about Technology Preview features, see Scope of Coverage Details. nova.cells.weights.all_weighers - Uses all cell weighers(default). nova.cells.weights.mute_child - Weighs whether a child cell has not sent capacity or capability updates for some time. nova.cells.weights.ram_by_instance_type - Weighs the cell’s available RAM. nova.cells.weights.weight_offset - Evaluates a cell’s weight offset. A cell’s weight offset is specified using --woffset `in the `nova-manage cell create command. Multiplier for hosts which have been silent for some time (negative floating point). By default, this value is -10.0. Weight value given to silent hosts (positive floating point). By default, this value is 1000.0. Multiplier for weighing RAM (floating point). By default, this value is 1.0, and spreads instances across possible cells. If this value is negative, the cell with fewer RAM is prioritized, and instances are stacked in cells. Multiplier for weighing cells (floating point). Enables the instance to specify a preferred cell (floating point) by setting its weight offset to 999999999999999 (highest weight is prioritized). By default, this value is 1.0. Make a static copy (not running) of an instance for backup purposes or to copy the instance to a different environment, make a snapshot using nova image-create (see Migrate a Static Instance). --password - Admin password to set for the evacuated instance (cannot be used if --on-shared-storage is specified). If a password is not specified, a random password is generated and output when evacuation is complete. --on-shared-storage - Indicates that all instance files are on shared storage. Use the Create Volume option to create a volume and entering the values for volume name, description, image source, volume type, size and availability zone. For more information, see Create a Volume in the Managing Storage Guide available at Red Hat OpenStack Platform. Use the Edit Image option to update the snapshot image by updating the values for name, description, Kernel ID, Ramdisk ID, Architecture, Format, Minimum Disk (GB), Minimum RAM (MB), public or private. For more information, see Update an Image. 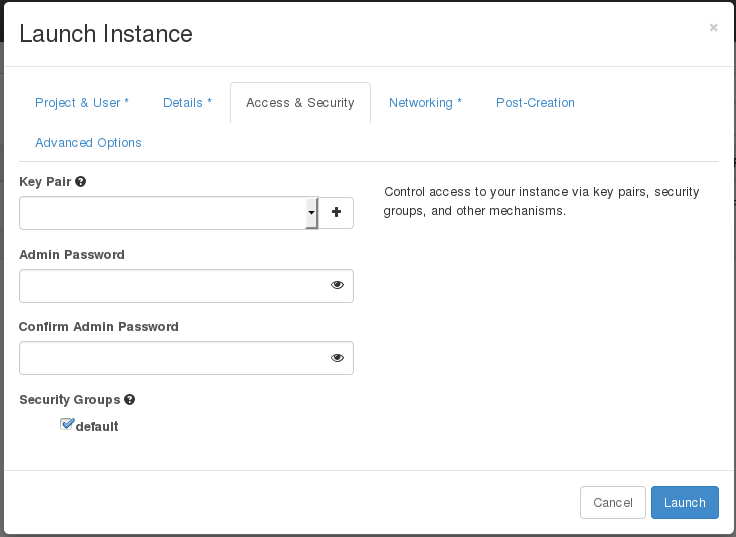 For more information on launching an instance, see Create an Instance. As of the Red Hat OpenStack Platform 7 release and later, Compute’s libvirt driver automatically requests the QEMU Guest Agent to freeze the file systems (and applications if fsfreeze-hook is installed) during an image snapshot. Support for quiescing file systems enables scheduled, automatic snapshots at the block device level. Here DEVICE_NODE is the root device node (for example, sda, vda, etc). Replace the UUID value in the /etc/fstab file with the new UUID. For any additional partitions that are mounted in the fstab file, you may need to replace the UUID value with the new UUID. 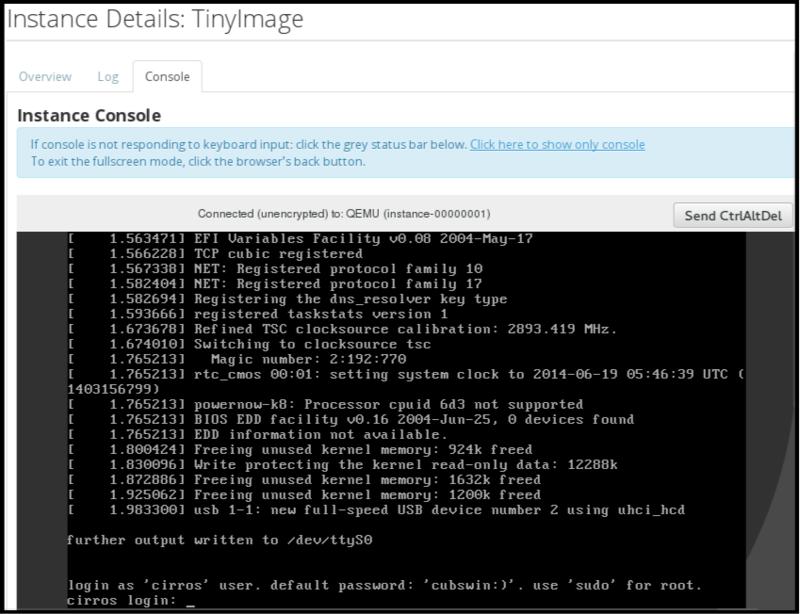 You can also upload an image using the OpenStack Dashboard, see Upload an Image. 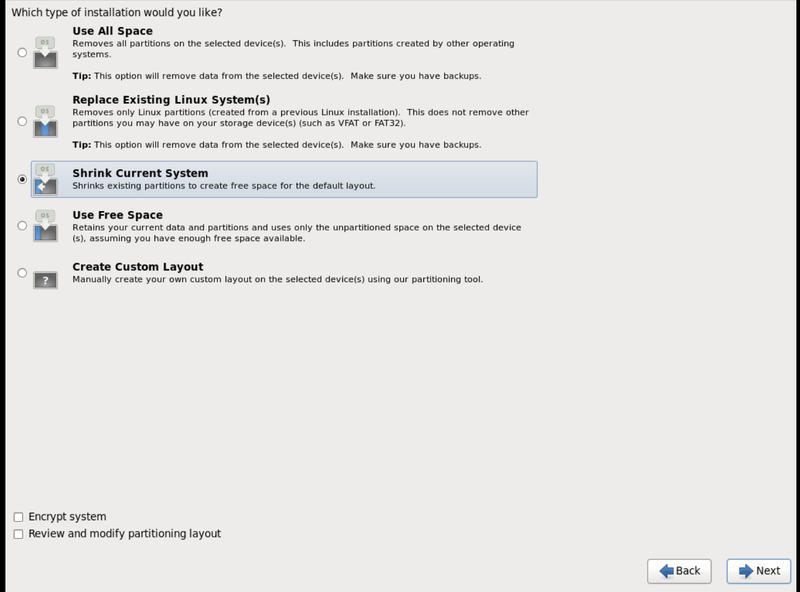 Background information about NUMA is available in the following article: What is NUMA and how does it work on Linux ?. Behavior set using image properties overrides behavior set using flavors. For more information, see Manage Flavors. scsi, virtio, ide, or usb. Integer. For a detailed example of NUMA-topology definition, refer to the hw:NUMA_def key in Add Metadata. Mapping N GB of RAM to NUMA node 0 (does not override flavor definition). Mapping N GB of RAM to NUMA node 1 (does not override flavor definition).